Set up to be supple and tough, our 6×12 galvanised rope range is full of surprises in terms of its design and features. With this 6mm diameter product, you get a rope that can hold loads in place effectively while battling corrosion and avoiding fatigue throughout prolonged periods of use. Galvanised rope will not corrode, as the steel is coated in zinc to stave off rust and remain untarnished come rain or shine. Maritime operations tend to involve more than their fair share of moisture exposure, yet even briny splashes will do little to impact this type of rope. Shrouded by six steel wire bundles, made up of 10 strands apiece, you will find fibre cores throughout. Even the slender 6mm thickness of this rope allows for such a construction to be used. This does create compromises when it comes to breaking force and crush-resistance, but makes up ground with excellent flexibility. With a 1.5 tonne load limit, the highest quality example of this 6mm 6×12 Galvanised Wire Rope is reliable as a lashing option and made to last. 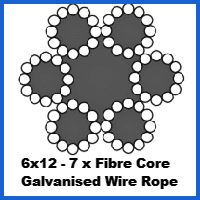 With the same fibre core setup but twice as many strands, our 6×26 galvanised rope could grab your attention. If pure strength is what you need, the wire core construction of our 6×36 rope will do the trick. Asking the experts at Rope Services Direct a question is as simple as calling 01384 78004 or visiting our contacts page to email them. 6mm 6x12 Galvanised Wire Rope Overall rating: 5 out of 5 based on 6 reviews.